Cashmere fiber has irregular, sparse but deep crimp. It is consisted of squama and cortex while it doesn’t have medulla. The density for its scales is about 60-70 pieces per millimeter and the cross section of the fiber is close to round. The diameter of cashmere is finer than good wool with average fineness 14 to 16 microns. The rate for unevenness of fineness is as low as 20% and the average length for fiber is 35 to 45mm. The strength, extension, length and hygroscopicity of cashmere is better than that of wool and it integrates the advantages of being fine, light, soft, smooth and warm. Cashmere is springy and owns moderate strength as well as a natural soft color. Cashmere is more sensitive to acid, alkali and heat than fine wool. Even in conditions of lower temperature or lower concentration of acid and alkali liquid, cashmere fiber is easy to be damaged. Besides, it is especially sensitive to oxidizing agent containing chlorine. Cashmere has the following characteristics.The fiber of cashmere is fine, lightsome, soft and warm. Cashmere is the finest and lightest among all animal fibers. It has a high degree of natural curl and can arrange and hold closely in spinning. With high cohesion, the warmth for cashmere is excellent, almost one and a half times or twice as good as that of wool. The outer scale of cashmere fiber is tiny and smooth and there is a layer of air between the fiber, which makes it light, soft and smooth. Cashmere color is natural and soft. The fineness of cashmere is even and its cross section is mostly regular round. That makes the fiber strong in hygroscopicity, so it can fully absorb the dye and is hard to fade. 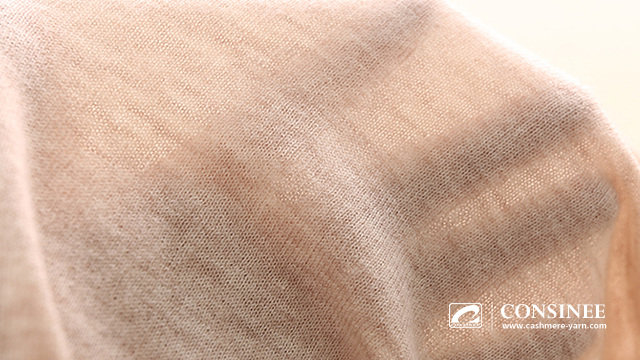 Compared with other fibers, cashmere has the advantage of being natural, soft, pure and gorgeous in color. Cashmere is soft and elastic. As the number, rate and recovery rate of crimp for cashmere fiber are all large, it is suitable for processing into knitwear that is full in hand feeling, soft and elastic. Besides, cashmere has good ability of recovery, which won’t shrink after washing and keeps good shape.